Why use games in the classroom? Games work and I think that most teachers use games and fun activities in their lessons. This post will firstly examine why they work, and encourage their wider use, and secondly provide two games that you can download and print to use with your students that demonstrate some of the ideas below. There are certain elements of games which are obviously advantageous in language learning: repetition to revise vocabulary and practise pronunciation, humour to make chunks of language more memorable and collaboration to encourage students to learn from each other. I love using games because they are capable of this and so much more. They also bring competitive energy, discussion and enthusiasm into elements of a lesson that might otherwise seem dry by comparison. Above all they provide students opportunities to experiment with language and enjoy the process of learning and discovery. 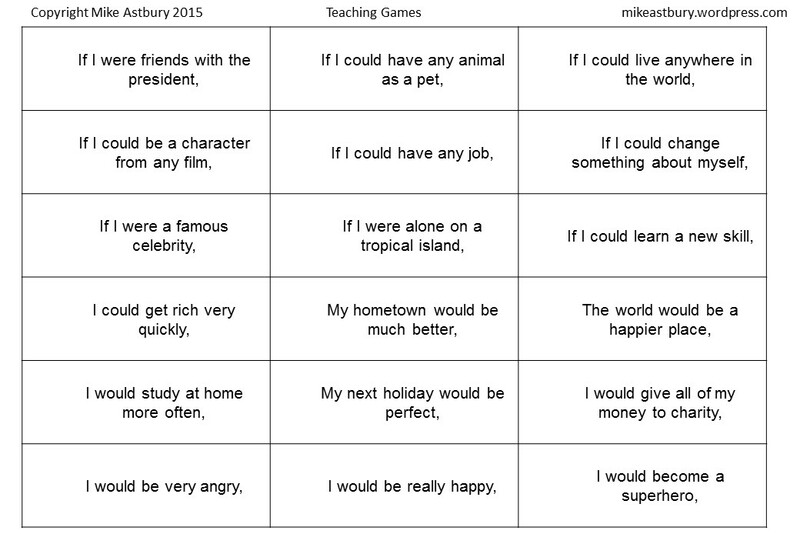 I would like to see games being used more often and as a larger part of teachers’ lessons. I love seeing games being used but often they are a quick distraction during the lesson or a reward at the end. While this is a valid use of games, they are actually extremely adaptable and can go beyond this limited scope. Also, while I have nothing against the staples of: dominos with matching pairs, roll and move dice games and crosswords, modern games have moved on. Modern board games include a mixture of conversation, tactics, puzzles and creativity. Modern board games often have mechanics which are perfectly suited to the classroom and fit neatly into EFL teaching methodology. It’s going to take some time for these games to reach the mainstream, so if you’re a teacher who enjoys using games in your lessons you should be seeking them out, rather than waiting for published material to catch up. I would like to examine two examples and in the process give you two ready-made activities to try out yourself. This is a simple game that can be used with a wide variety of language. I’ve chosen second conditionals as an example as they are particularly suitable to the nature of the game, which involves taking half a sentence and thinking of a way to complete it. The game is played in groups of 4 to 6, but I would play one round with the whole class first as a quick introduction; showing is far easier than telling. This game is suitable for intermediate students and above. Each group is given a set of cards, shown above, and a stack of small sheets of paper. The sheets of paper should be big enough for students to write a legible sentence on. The first player draws a card and reads it aloud to the group. Now, the other players each have to guess which answer they think is the “real” one that the first player wrote. Once everyone has made their choice the first player reveals which one was their answer and why. This part can be in an open discussion in most cases, especially for adult classes where they’re not too interested in winning points and are more interested in who wrote what. This is the case with a lot of creative games and you’ll rarely need to worry about keeping score. Some students, especially competitive teenagers, may prefer to choose the correct answer in secret so that you can keep track of each player’s answers and award points for correct guesses. Students make their guesses by writing down their choice. They can get two points for a correct guess with the correct grammar structure, or one point for an incorrect answer with the correct grammar structure. This means they should be focused on listening to each other because they are being awarded for accuracy. This is less communicative but you can talk about their choices after the points have been awarded. After the first round students will understand the game far better than if you try to explain it beforehand. They will also understand that a big part of the game is in fooling other people into guessing your answer. The range of answers and the creativity of my students has impressed me and the game has always been very well received. At the end of the game you’ll be left with a lot of written language to use for feedback and error correction in the following lesson. 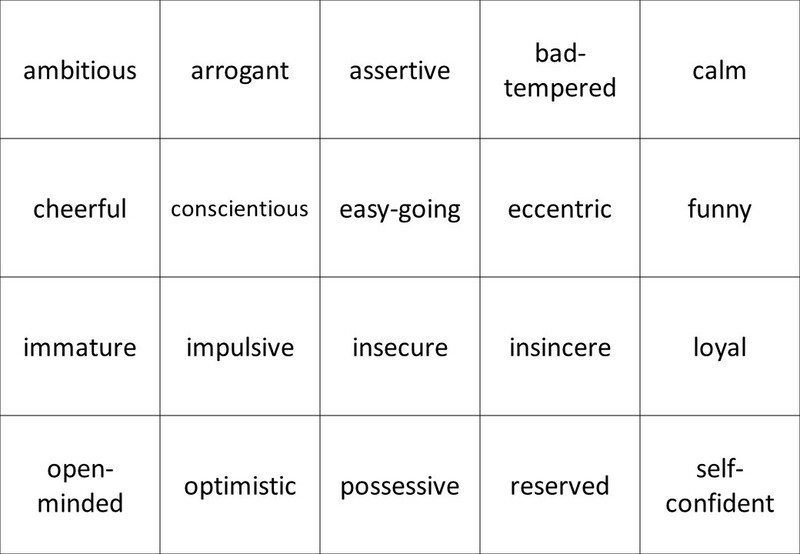 This is a speaking game comprising of two sets of cards: professions and personality adjectives. The game is played in groups of four to six students. There are 60 profession cards and 40 personality cards. 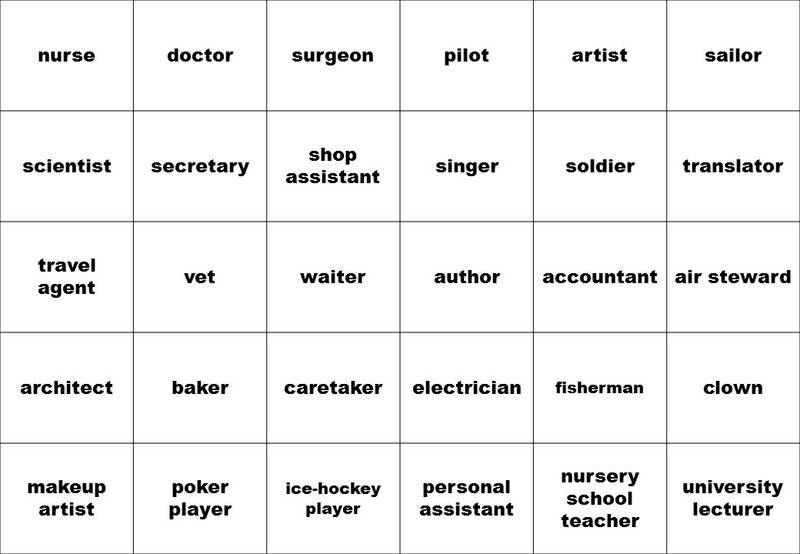 This version was made for an upper intermediate class but could be adjusted for lower levels if you chose simpler adjectives and a smaller set of professions. Each player is dealt six cards from the professions deck. A starting player is chosen, who will be judge for the round, and that player takes a card from the personality deck. They reveal the card to the other players, who then each choose a profession card in their hand which best matches the personality adjective. Then, players take turns explaining why their profession card is the best match to the judge’s personality card. After everyone has had time to explain their reasoning (including a degree of debate) the judge picks a winner. Here is an example round of the game: There are five players, four players who are competing and one judge. The judge’s card is ‘wise’. The four players select professions which fit this adjective and reveal their cards. The four cards the judge has to choose between are surgeon, newspaper editor, lawyer and diplomat. Each player gives their reasons and the judge asks a few follow up questions. After a short discussion the judge then picks a winner. The winner is given the personality card to show they won the round and each player draws profession cards until they have a full hand of six. Then the role of judge moves clockwise and the game continues until a player has won three rounds. The game is very simple to follow and generates interesting conversations and unique arguments. The great variety of jobs and personalities in the game means that the game will be different every time. Students are encouraged to justify their card any way they can, which means that they can try to gain the judge’s favour by being the funniest or most inventive. This gently competitive edge pushes students to think creatively so they should generate less conventional ideas. Players don’t win by having the right card; they win because they give the best or most interesting explanation. The card sets include some tongue in cheek professions like drug dealer, queen and magician. This creates a lot of unexpected combinations and unusual debates. My set includes a lot of professions that revolve around crime and media because it’s what we were studying at the time, so feel free to change the cards to match your own syllabus. You could also try other noun and adjective combinations.